You’ve got into the declutter habit. And you’re ready to let stuff go. But you don’t want to just chuck it out. And you would like to – or really need to! 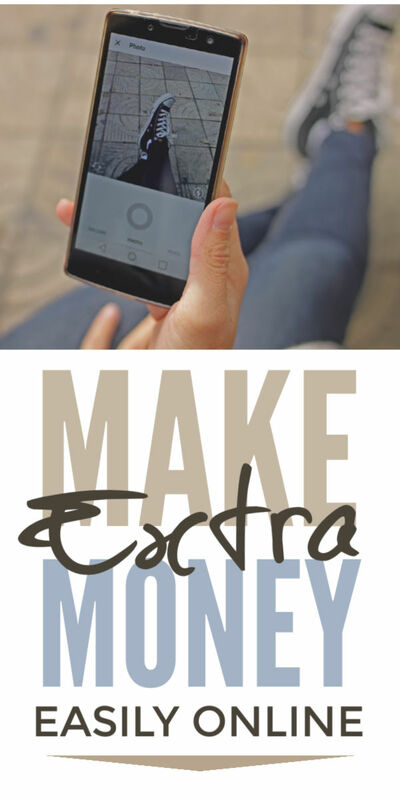 – make money from your clutter. Sell it on eBay right? Or Craigslist? I used to think so. But as I’ve let go so much stuff over the last two years, my best friend has been Facebook! Now I know, I know. There are all sorts of reasons for us to be mad at Facebook right now. BUT Facebook is actually a brilliant platform for selling ALL sorts of clutter. And especially the clutter that doesn’t sell OR is not worth selling on eBay. And just doesn’t move on Craigslist. Let me take you through the big benefits I’ve found of selling clutter on Facebook. 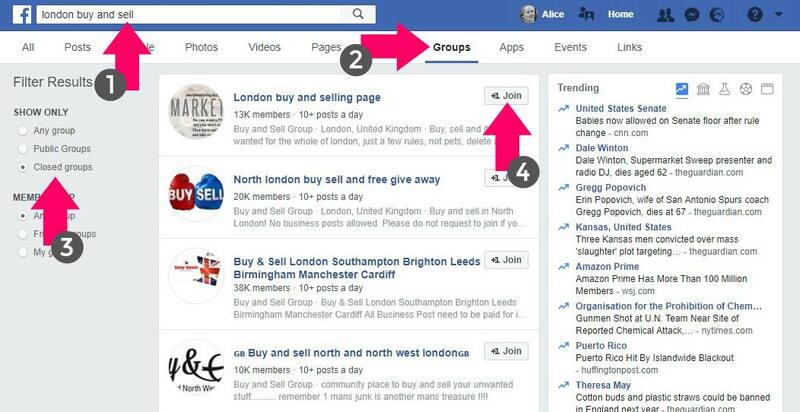 Then I’ll give you some tips on Facebook Buy & Sell Groups to join. 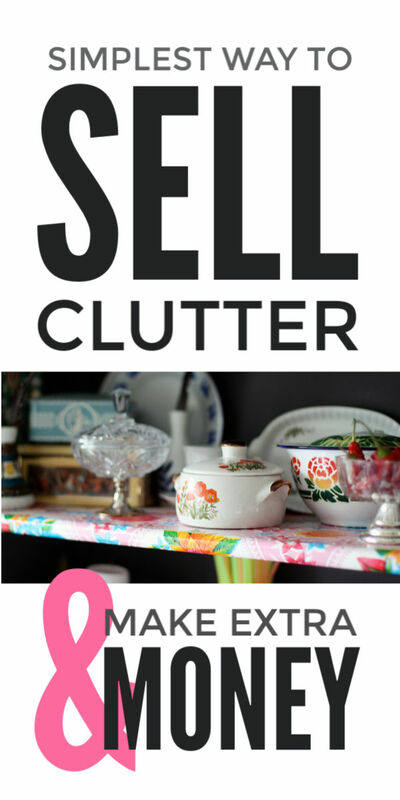 And some real practical help on how to sell clutter on Facebook if you’ve not done it before. AND Facebook puts your stuff in people’s face so they say “ooh how lovely” even when they’re NOT actively searching, and that I promise you is enormous! PLUS it’s super friendly so you can get help selling. Let me share some personal examples to make it a bit more real. Like most mothers, I was drowning in piles of kids toys, clothes and kit. But selling them on eBay I’d make tuppence ha’penny if I was lucky. AND actually lose money by the time I’d packaged it all up and traipsed to the post office. Which totally demoralised me about decluttering full stop. But, personally, I couldn’t afford just to give the whole lot away! 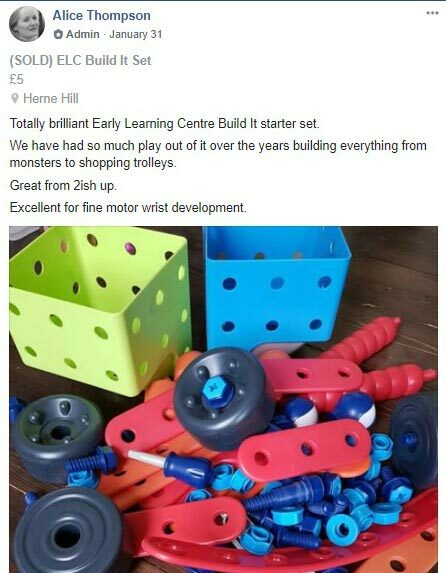 … it takes me 5 minutes tops to pop a little bundle of stuff on my local Facebook buy-sell group. That stuff actually appears in the Facebook feed of other local mums. So there’s NO packaging. NO trips to the post office. 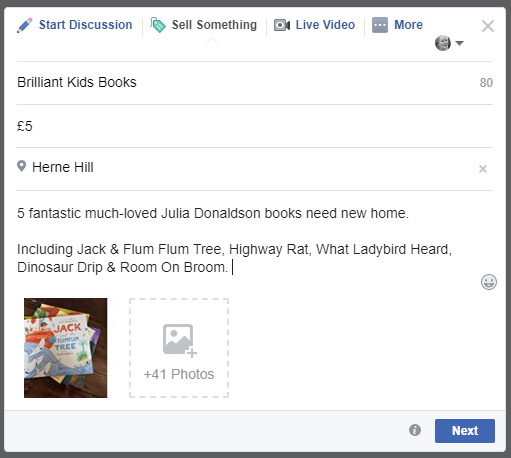 With Facebook, it’s suddenly cost effective to sell all that clutter in the £5-£20 range. But Facebook has also worked brilliantly for all our BIG clutter. Bikes. Scooters. Car seats. Camping stuff. Garden stuff. A wheelbarrow! Even an old compost heap! We’ve cleared the lot locally via Facebook. Because even neighbours in our little corner of south London who aren’t actively looking for a new wheelbarrow will come and grab one going cheap on their doorstep! Now. I have given some big clutter away for free on Facebook. BUT that has still saved me the time and money of a trip to the tip. AND helped the planet a bit! All in all, Facebook has made selling clutter easy, week in, week out. Which is totally brilliant BECAUSE – as I’ve explained here – little by little is the BEST way for most of us to declutter. AND little no effort sales of 20 or more quid every week PLUS a few biggies really add up! So. Now let’s find out how to sell clutter successfully on Facebook. And the first thing we need to do is join some buy and sell groups. Facebook buy and sell groups are the best way to get your lovely clutter in front of other people. 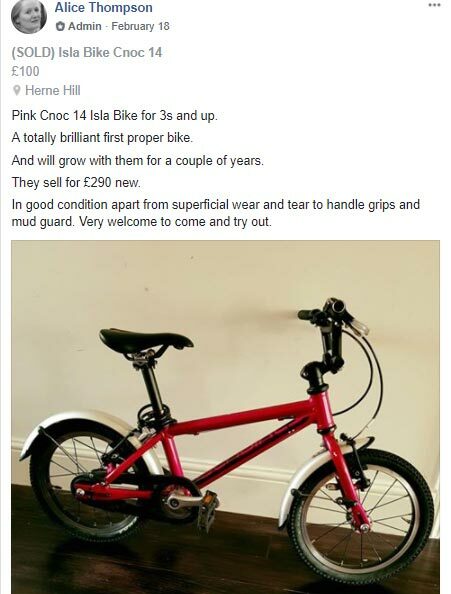 PLUS if you are a parent, the most local parents buy and sell group you can find. PLUS if you are decluttering collections – e.g. china, comics – specialist groups for your interest. Once you’ve been accepted, read the group rules. And then you are ready to sell your clutter on Facebook. Hurrah! But I’ve got a few top tips for you on how to make sure stuff sells. All you have to do to sell clutter in a group is tap on Sell Something. (On your phone, this may be under the 3 dots to the right of Write Something). Remember, your post appears in people’s Facebook feed. One stand out photo – one photo will stand out better than lots and save you time. Even if you’ve selected one group, you’re given the option to post to others at the same time. I usually post to my most local first. Then if there’s no response after a day or so, I go back into the group. Click on Your Items. And then on Post To More Places, which lists the other groups you are a member of. But how do you know someone’s interested? Simple, they comment. And there’s an easy Facebook selling etiquette for dealing with comments. The Facebook etiquette is first come, first served. So first person to comment they want it, gets first dibs. Ideally they will send you a personal message (PM) on Facebook to confirm. If they don’t just hover over their name and tap Message. Once confirmed, just agree a collection time and provide your address. If they don’t confirm, just offer to the next person in line. Now. NOT everything will sell. I give low value stuff a couple of weeks across multiple groups before posting in FREE groups. But avoiding these NO-NOs will help. 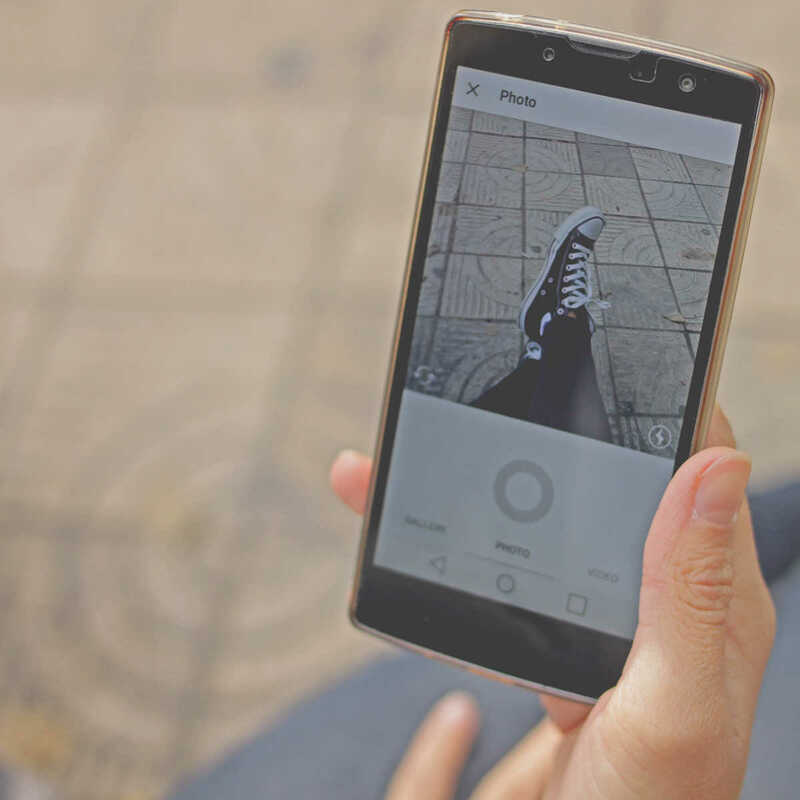 Share blurred, badly lit photos – if you can take with natural light behind you against a plain, ideally white background. Get help from friends, kids or grandkids if you’re struggling. Be unrealistic about price – remember clutter itself has a cost! AND that last one is super important. Clutter eats up our time. Makes us mad and miserable. Prevents us from looking after things properly. And actually encourages us to buy more and more stuff we don’t need. So don’t fall for the hidden treasure in the attic myth. Honestly, it’s a tale as old as time that one! Just use Facebook as an easy friend to little by little, week by week, slowly and surely sell all that clutter that you will be so much happier without! I do so hope this helps. If you have any questions at all. Fire away. They are all welcome. 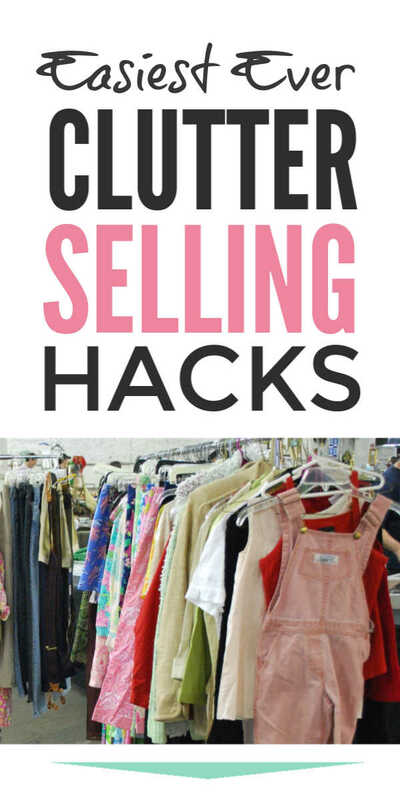 And for more help check out all my other step by step declutter guides. And sign up for my FREE support mails and declutter with me.